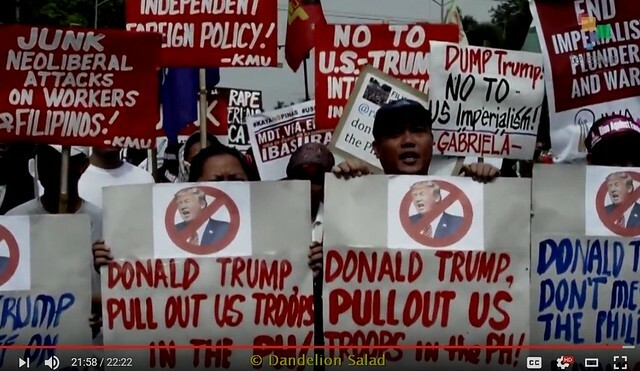 This entry was posted in All Posts News Politics and-or Videos, Dandelion Salad Videos, History, Human Rights, Human Trafficking, Imperialism, Labor, Resistance and tagged Abby Martin, Colonialism, Damayan, Philippines. Bookmark the permalink. Nice selection of links Lo. Thanks, Virginia. It’s a tough subject. Sure is, Lo. Excellent episode. Gut-churning in its implications. We can rage and rage and nothing seems to happen, until we risk falling prey to our own weary distemper and loathing of injustice. Frustration and impotence are always a recipe for dominant elites to exert ever more fascistic advantage & assert brutal control; to murder and intimidate. So fear and bludgeoned uniformity, not solidarity, will prosper wherever they are allowed to fester and rule. Export your population, and import basic necessities……what neo-colonial insanity is that? The displaced populations end up serving the machinery of ecocide that produces only cattle food,but are expected to show gratitude in return. This is a cycle that will never be broken until there is nothing left to steal. Or conversely, those who are still able to do so, find the will to organize themselves & legally prosecute the oppressor and criminal. There is no point raising arms against the US, it is a top-heavy disaster awaiting collapse. It is our civic duty to demand that our (secular) institutions fulfill their responsibilities and exercise their mandate through an accountable legal process, that grants representative powers and executive privileges. Unless we do this all government, globally, will disintegrate into a permanent moral sham and a cynical deception that serves only the tyrant, the liar, the impostor and the tycoon. It is not a question of which badge or ‘brand’ we adopt, it is about an ultimate confrontation between cyclopean vested interest and the ethical principle of governance itself. If everyone just consumes, we shall all end up as biophobic, robotic cannibals. We must all be prepared to produce eco-systemically, in accord and in direct proportion to our needs, our circumstances and our innate abilities. So we have to understand and respect the principle of the rule of law ~ law that is both metaphysically adequate and ecologically demonstrable. Law that recognizes the biosphere as a global commons belonging to no individual state or entity, that is the healthy & wholesome responsibility of all to maintain. Law that prevents ecocidal abuse, severely admonishes the deviant & robustly ‘pillories’ the perpetrator ~ whomever, or whatsoever they may be.